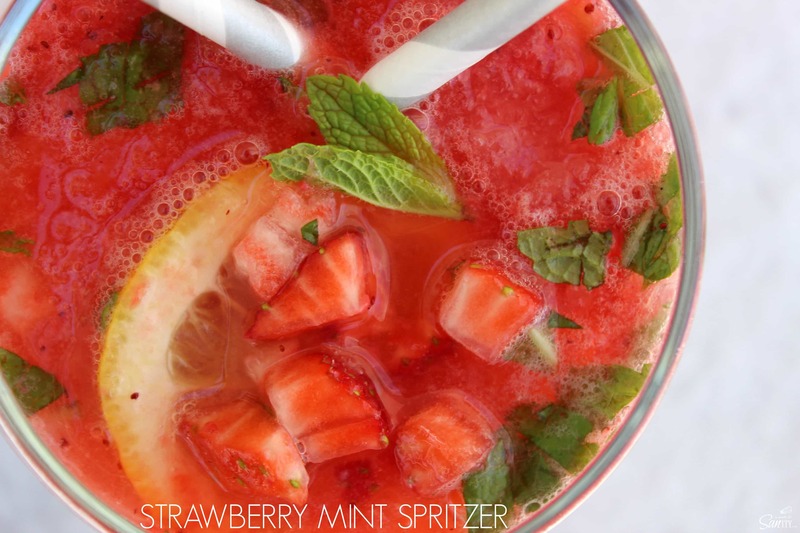 Strawberry Mint Spritzer is a fresh, fruity, & thirst quenching non-alcoholic beverage that is made with 4 simple ingredients and ready in just 5 minutes. Like my friend Sarah would say when something is unbelievable…”shut the front door!” And oh my you will just not believe just how amazing this drink is, well that is until you try it. Seriously. Get to that now. Have you had a hard day at work? OR were you locked up in the house all day with 5 kids, like me? Or do you just need a good drink to relax? This is it. And it is simple. Here is the catch: it is non-alcoholic. That’s right, but that doesn’t matter, trust me, it is amazing. My friend Ashley tried it and said it tasted just like her favorite strawberry margarita.We’ll Ashley hold the calories and the tequila – this Strawberry Mint Spritzer has everything you need in a fresh, thirst quenching drink. And it is a beauty to look at. Inspired by a girls-night-out this drink will continue to bring friends together in the years to come. While this will be the perfect drink to serve in the spring and summer months DON’T WAIT until then. MAKE THIS NOW. Am I shouting? Yes, it is too good to wait. 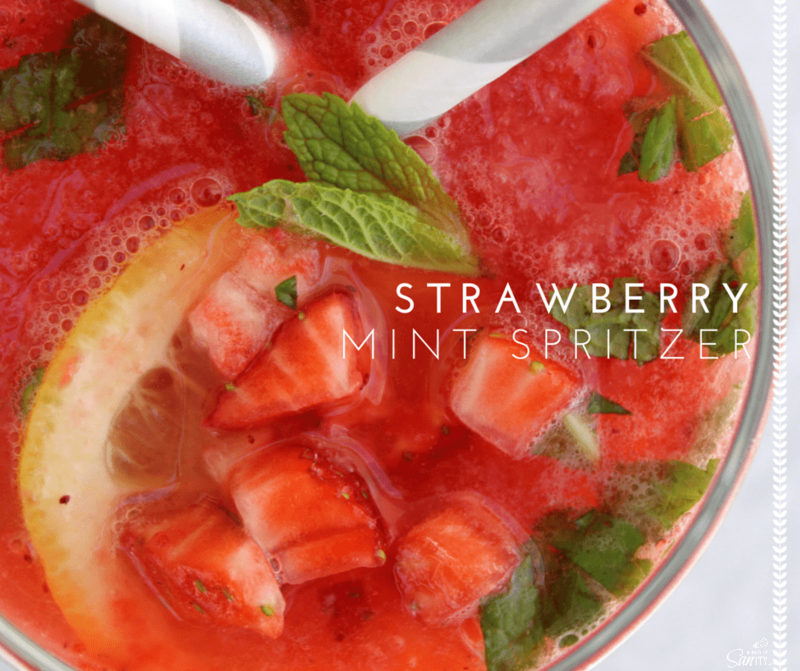 How do you make this Strawberry Mint Spritzer? Place the strawberries in a blender or food processor and puree. In a large pitcher stir together soda, 1/4 cup chopped mint (more if desired), and lemonade concentrate. Add the pureed strawberries to the bottom of serving glasses or serving pitcher. Gently pour in the mint & lemonade mixture on top of the pureed strawberries, garnish with lemon slices, diced strawberries, and mint leaves. BLENDTEC: I love using my Blendtec blender to make this and would highly recommend that you use one too – make the process so easy! However, you can use whatever blender that you have. 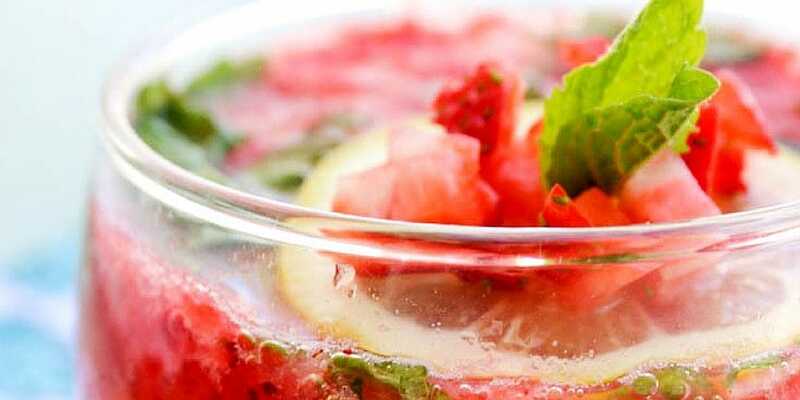 Want more refreshing drink recipes? 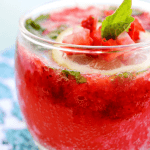 Try this Cherry & Berry Spritzer, or my favorite Tropical Italian Cream Soda. This looks and sounds delicious! I’d love to try this recipe! What a fantastic summer drink! So refreshing and seriously gorgeous! This little drink is calling my name! Can’t wait for patio weather to enjoy it!! !